Sure, the possibility of winning the $20 or so dollars a small elite group gets deposited nightly in their online wallet is enticing; but it is no accident that majority of the show is Scott's banter, his mangling the names of participants as he attempts to call out an impossible number of them; his commenting on random texts, sharing birthday wishes, and poking fun of groups of participants to the delight of others. It is our involvement with Scott, our desire to be personally acknowledged and/or perchance celebrated on the closing review of winners that keeps us there until the end and coming back for more. "I have to admit this was one of the best virtual discussions I’ve had, and more than half of the session was driven by audience questions." 2. COMMUNITIES EMBRACE LIVE INTERACTIONS OVER SOCIAL MEDIA - “ ...top companies realize that building great communities engenders long-term brand loyalty. Nothing drives strong communities better than in-person and live interactions." 3. SOCIAL LEARNING OUTPERFORMS REMOTE LEARNING - "Social-learning promotes autonomy and self-direction, increasing overall learner engagement. It can also be a welcome departure from online courses which can be lonely, isolated experiences that lack engagement. Learners do not feel the presence of other learners in the experience." I'm excited to be speaking at the Sales 3.0 Conference this March and look forward to seeing you there. For more info and tickets click here or contact me directly at scott@shindigevents.com. NYT’s "The Post-Text Future”: Are Video Chat Events The Answer? Here's how Shindig’s unique technology delivers on all three and more. "You know I love this format. It was very cool." "Thanks to Shindig for allowing me to chat directly with my fans and take their questions. This is the future of fan engagement." Shindig is proud to partner with the UB Women in STEM Cooperative on "The Next 10 Years: Helping STEM Students Thrive," a series of video chat events on inclusion and improving the status of women in the fields of science, technology, engineering, and mathematics (STEM). The Cooperative itself is a collaboration between the University at Buffalo and Cornell University and features the perspectives of national thought leaders and institutional representatives about expanding the participation of women in undergraduate STEM education at different scales. Don't miss out on this groundbreaking series and sign up today! "Shindig far exceeded Skype's capacity and should be a great enabler in the future for gatherings with such far-flung participants." “Now is the time to lean into distance learning for overcoming this disaster. Through state-of-the-art virtual learning environments such as Shindig, we can start the semester and keep classes going." FantasyPros is one of the premier online resources and communities for all things fantasy sports. It's branched out from being a forum for fantasy sports fans to bringing on its own in-house experts, write articles and produce content aimed at informing FantasyPros readership/subscribers how to win their fantasy leagues. "Shindig created a pretty awesome live-streaming experience, effectively DJing an interview between me and the fans. I loved it!" 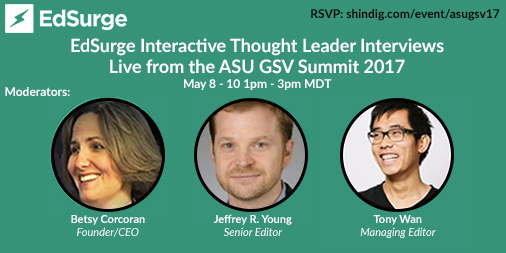 Thanks to our virtual attendees of the EdSurge ASU + GSV Interview Series! On the week of May 8th, 2017, anyone and everyone with a vested interest in learning and talent innovation packed their bags and headed to Salt Lake City to attend this year’s ASU + GSV Summit. Shindig was certainly in attendance, and not just to mingle with the learning community, but to also power an interactive interview series, produced on-site by leading edtech media outlet, EdSurge. The series featured some of the most influential thought leaders, top executives, and authority figures within the business of providing or enabling education. Some big names included: Chip Paucek (Co-Founder and CEO of 2U, Inc.), Scott Pulsipher (President of Western Governors University), and Jessie Woolley-Wilson (President and CEO of DreamBox Learning), to name just a few. Thanks to all those that tuned in and participated! And for those of you that missed out on the live event, no worries! Follow this blog, or any of our social media pages (FB + Twitter), to stay tuned for when we upload the event recordings. "The opportunity to share Roadtrip Nation with so many people in one (digital) space was terrific. The experience felt expansive and personal at the same time." The IRA’s Executive Director, Dr. Susie Ellis, and Deputy Director, CeCe Sieffert, were in tow to answer questions on behalf of the foundation. Attendees received an in-the-trenches account of the preservation efforts and even got to view video footage of a baby rhino named Delilah's first birthday celebration. Interested in promoting awareness to and social interaction with your cause? Let us know, we can help. "I love the Shindig interface! It makes web conferencing events visual, tangible and feel more IRL." "Shindig has facilitated some excellent Q&A sessions between my faculty and members of our educational website. It boasts all kinds of exciting and useful features -- and the staff is very helpful, too." "Stories—genuine stories—really matter. We're excited to be helping tell the authentic stories of the people who are building the technology that supports innovations in teaching and talent," says Betsy Corcoran, CEO and Founder of EdSurge. “We are delighted to be working with EdSurge and Shindig. These interviews are an important component of our efforts to elevate innovation leaders in learning and talent development to extend the reach of their ideas," said GSV Managing Partner Deborah Quazzo. "It is good to present. It is better to engage ideas and to spark conversations that make others jump into the fray. That is what Shindig can do and it's a huge differentiator." It was an intimate gathering at a hotel suite, unstaged and authentic, as the rockers buzzed excitement for their upcoming festival showing, waxed nostalgic of their late rocker alums, and casually chit chatted about life in the music lane. Fans and audience members from across the nation tuned in to interact with the musicians and participate in the Q&A. One fan asked what these rockstars did to seek inspiration -- let's just say, the response was very honest. "It was fun to see people regrouping and mixing up. I liked that I could join small groups and bring people up in front of the class. It was really nice to be able to connect with the students in this way!" "I've never seen a webinar that is so calming and fun to do. Thank you Shindig!" On December 20, YouTube influencer Joi Wade hosted her first Q&A session on Shindig for aspiring college students interested in gaining admissions into top US schools. With over 18,000 followers, Joi's channel focuses on covering college life and admissions. She is currently a freshman on a full scholarship to the University of Southern California and recently published the book "You Got Into Where? How I Received Admission & Scholarships to the Nation's Top Universities." During Tuesday's event, Joi utilized Shindig's content sharing features to divulge tips and tricks on getting full scholarships, writing college essays, and more. Over 60 of Joi's YouTube followers attended, asking more than 50 questions about topics ranging from senioritis to international admissions to visiting college campuses. One lucky attendee also had the opportunity to win a signed copy of her book! University admissions can leverage the power of synchronous video chat and connect with prospective students around the world. Events can offer perspectives and advice from distinguished alumni and current students, and applicants and their families can engage with peers, guests, and admissions representatives in real-time, thereby providing a personalized experience that can make the difference in a student's decision to apply. Gone is the hassle and expense of having to travel physically to an information session; for many international or remote students, this simply isn't an option. Admissions offices will be able to tailor events to specific student demographics and needs, reaching a global audience in an interactive, highly personal way. "Shindig is a very cool platform and I love how you can talk face to face with your viewers. It makes the experience more memorable. I had a great time hosting and I know my viewers had a great time watching." On November 9, Shindig hosted an event with Davidson College's political science professors Dr. Susan Roberts and Dr. Andrew O'Geen. The hot topic of discussion was US voting access and fraud - a trending conversation especially after the historic presidential election. This was part of DavidsonX, a micro-MOOC series provided through the edX platform, on incorporating current events and world affairs into compelling discussions amongst students. With over 50 in attendance from 9 countries including the USA, Germany, Iceland, Taiwan, Russia, and more than 30 thought-provoking questions, this event certainly engaged those seeking to better understand American politics as well as provided them an opportunity to share concerns, ask questions and engage with one another. Traditionally, online learning has offered one dimensional knowledge transfer from educator to student. This Shindig powered session is a reminder that there is ample opportunity to provide distance learners to collaborate and interact with one another in ways that extend far past simple discussion boards or emails. By enabling real-time conversations, reactions, and discussions, students integrate more deeply into their learning community and contribute to greater student body cohesion. These benefits also extend to educators, who have increased high-touch interactions with their learners. Davidson's mini-MOOC series on political science is only one example of the many possibilities available to online educators and students for more integrated online experiences. "The Shindig platform has transformed the way in which we digitally engage with our students. It allows the faculty an opportunity to diversify the curriculum and pedagogical approaches, while aligning with the millennial students eagerness to digitally engage." On November 7th at 3pm, Rock the Vote held a first of its kind interactive Online Voting Rights Rally. Hundreds joined the interactive discussion live on the Shindig video chat event platform and were able to ask NAACP CEO & President Cornell Williams Brooks and Kristen Clarke, President and Executive Director of the Lawyers' Committee for Civil Rights Under Law questions about their rights and the voting process as they prepare to cast their first ballot on November 8. The event was moderated by Rock the Vote President & Executive Director Carolyn DeWitt, and had a special appearance from author and contributing writer to The Nation, Ari Berman. It reached voters from 44 states. “What’s the best way to describe Shindig? It’s like Google Hangout’s cooler older brother, with the better gadgets. The platform brings any event into a branded social media experience that can be attended anywhere." On Tuesday, November 1st, Shindig hosted the first-ever gathering for the University of the People, a tuition-free online university. Over 200 students, educators, and administrators from 37 different countries came together as President Shai Reshef spoke about the University’s journey and its future goals. Online events such as these give the UoPeople community a unique opportunity to directly interact with leadership, meet peers across the world, and connect to the larger community. Students, volunteers and faculty alike were able to take the stage and talk with President Reshef about the University, while others became acquainted with peers in private chats during the event. In total, over 30 audience-generated questions fueled the discussion on the University’s vision and agenda. These interactive sessions can effectively enhance the crucial social components of education that are paramount to learning but are often lacking in online environments. "Today's Shindig event blew me away. MOOCs introduced me to Google Hangouts and I thought they were amazing. But taking part in today's event and actually interacting with students and Professor Comer was so motivational and inspiring." On Friday night, PBS and WNET partnered with Shindig to host a live interactive Q&A with Norman Lear about the upcoming American Masters documentary, “Norman Lear: Just Another Version of You.” Hosted by WNET President and CEO Neal Shapiro, the event invited participants to submit questions live to Lear both on Shindig and through Facebook Live. “This technology astounds me!” said Norman Lear. “You and me both,” replied Neal Shapiro. You can watch highlights from this event here to see how Shindig and Facebook Live can work together. Be sure to join us next Thursday, October 6, 7:00 - 8:00pm (EDT). You can RSVP now to receive an email reminder on the day of the event. To watch on mobile, download the Shindig app from iTunes or Google Play. Professional triathlete Eric Lagerstrom shared some of his favorite videos he has created over the last few years with an interactive online audience. Eric also discussed the gear he used, and gave tips on how fans can recreate some of the same action shots. The online event was also broadcast on sponsor Argon 18's Facebook page via Shindig's Facebook Live integration. Argon 18 was enabled to reach a wider audience and archive the recording for those unable to attend, garnering nearly 1,000 additional views since the time of the event. "We are very excited about the enhanced interactivity a partnership with Shindig brings to teachers and students using Canvas,” said Troy Anderson Director of Partnerships for Instructure. " Shindig's peer-to-peer approach to synchronous video chat for teaching and learning is a valuable addition to the online Canvas experience. The platform’s robust teacher-to-student and student-to-student engagement can enhance student body formation and student retention." (NEW YORK) June 7, 2016 -- Shindig, the video chat event platform, announced integration with Facebook Live today. The integration puts at the disposal of Facebook Live hosts a full multi-camera production suite such that they can bring multiple remote subjects on “stage” before the Facebook Live audience to interact with one another as well as introduce pre-recorded video, slides and other multimedia. The integration expands the capabilities of Facebook Live, allowing for seamless switching from one camera view to another in full screen of one personality with the other inset; or having multiple cameras videos both presented with equal priority. Shindig (Shindig Overview Video) also enables a virtual TV studio audience to interact with the special guests before the Facebook Live audience. Whereas Facebook Live itself only allows for text interaction between audience members and Facebook Live hosts, Shindig integration adds capability for a webcam enabled online studio audience to interact with the guests in video chat. Additionally, a host can have an assistant pre-screen such guests prior to bringing them to the stage. When the participants are brought to the stage they interact with the guest in video chat before both the audience viewing on Shindig and through Facebook Live. "Facebook's power to aggregate audiences paired with Shindig's unique video chat interactivity creates an unbeatable opportunity for personalities and brands," said Steve Gottlieb, founder and CEO of Shindig. The integration is achieved by embedding the livestream of the Shindig event into a Facebook Live broadcast. The event can draw simultaneously a pre-promoted audience given the Shindig URL where they can join the event without registration, signup or download as well as the Facebook Live audience that receives the notifications from Facebook. Viewers on Facebook can watch, comment, and react live on Facebook to the ongoing Shindig event. Hosts can alternate between interacting with text questions from Facebook Live audience members and video chat questions from those who have opted to join the Shindig audience. Participants on the Shindig platform can also enjoy other standard Shindig capabilities, including Shindig’s unique audience member to audience member video chat mingling. The integration allows for the interaction of Shindig to reach a wider audience via Facebook Live, without compromising the functionalities of either platform. Having a separate Shindig URL for the events in advance also addresses Facebook Live hosts’ concerns that they were previously unable to promote their live events to audiences beyond those who have already “Liked” them on Facebook or pre promote them to potential audiences outside of Facebook. Those unable to make it down to San Juan, Puerto Rico for the American Association of Political Consultants Pollie Awards & Conference were invited to join Shindig online for an interactive live stream of the AAPC Republican Caucus Boot Camp. Thanks to Shindig's hybrid event technology, online participants were enabled to ask questions to the panelists via video chat as well as discuss the issues with fellow online audience members. Guest speakers included Ryan Price (Founding Partner of The Trailblazer Group), David Rexrode (Political Director for RGA) and Sean Spicer (Communications, RNC). NEW YORK, NY (April 12, 2016) — eSchool Media, Inc, and Campus Computing today announced plans for interactive Thought Leader Interviews at the 2016 ASU GSV Innovation Summit on April 18, 19, and 20 in San Diego. The interactive interviews are intended to connect educators in schools and on college campuses with the Summit presenters and participants. Shindig, a turnkey solution for video chat teaching and event, will power the three day event. The interactive Shindig platform will allow moderator Casey Green, founding director of Campus Computing, and more than 25 interview participants -- education leaders, corporate executives, public officials, and foundation officers -- to engage directly with the online audience. “We are delighted to be working with eSchool News and Casey Green to extend the reach and audience of the Summit,” said GSV Managing Partner Deborah Quazzo. "These interviews are an important component of our efforts to elevate innovation leaders in learning and to extend the reach of their ideas." Shindig’s unique technology will also enable online participants to discuss, network, and socialize privately with one another as if they were attendees at the ASU GSV Summit. eSchool Media will host the interactive interviews on both eSchoolNews.com and eCampusNews.com. TheIinteractive Forum conversations from the ASU GSV Summit will also archived at eSchoolNews.com and eCampusNews.com for access after the Summit. Shindig, the large-scale video chat teaching platform, launched today the 50K Shindig Challenge, a research initiative meant to improve the understanding of the efficacy of interactive video chat to create a more connected online student course experience. To help educators better understand the evolving potential of interactive video chat, Shindig will partner with 25-50 faculty members and/or course designers at higher education institutions to incorporate complimentary use of the Shindig platform into their online courses in the Spring, Summer or Fall semester of 2016. Participating educators will receive grants ranging from $1,000 to $2,500 and be asked to collect and report data concerning attitudes and perceived effectiveness of Shindig’s platform. Educators applying for participation and looking for more information should visit Shindig.com/challenge. For those interested in experiencing the Shindig platform, please join our weekly Future Trends Forum hosted by Bryan Alexander. RSVP for this series is available at http://shindig.com/event/ftf. Bryan's weekly special guests include: Audrey Watters, Richard DeMillo, Casey Green, Will Richardson, Anya Kamenetz and Phil Long. The Pub podcast host Adam Ragusea and special guest Michael May, senior producer with NPR’s Story Lab, hosted an interactive, virtual celebration of The Pub's one-year anniversary. Participants were given the opportunity to pitch Michael their craziest idea for a new program and get his feedback. Over 50 fans of The Pub attended this special anniversary celebration. After a 30-minute chat with Michael May, Adam took text questions from the audience via the Ask Question feature. For the final 15 minutes, Adam allowed fans to take the stage and pitch directly to Michael via video chat. Popular YouTube gamer NoughtPointFourLive wanted a more engaging way to interact with his 500,000 subscribers aside from social media. In response, Nought (real name Fred) hosted a 5-part series on Shindig in which he performed activities such as livestreaming himself playing GTA V and hosting a game show-style quiz. Fred shared the URL for his impromptu Shindigs on YouTube just an hour before each event began. During these “can’t miss” events, Nought gave away codes for GTA V unlockable items and even awarded cash prizes for winners of his Quiz Night. The community built around Nought’s YouTube channel was able to interact face-to-face with each other as well as their video game idol. With very limited promotional tactics, over 500 fans attended. Alex Blumberg, CEO of Gimlet Media and host of the Startup Podcast wanted to actively engage his membership base with a video Q&A. Alex was able to actively engage with his members in the live Q&A. The event was password-protected and the URL was only distributed to Gimlet Media’s email subscribers. Alex provided a high level of value to his existing paid subscriber base and participants were able to interact with the hosts by using both the Ask Question and Raise Hand features on Shindig. The YouTube channel V-Squared wanted to raise money for an LGBT charity using Shindig and their 90,000 subscribers. Vinny and Luke Vaillancourt promoted the event with a series of tweets and videos spreading messages of goodwill for the holiday season. Using Shindig's ticket system, V-Squared sold over 200 $5 tickets by the time of the event, raising more than $1,000. Audience members were given the unique opportunity to interact with the V-Squared stars live as they shared their favorite holiday memories. The talk lasted for one hour and attracted nearly 50 viewers, who were also able to engage in networking during the session thanks to Shindig's sidebar functionality. The NJ Tech Council was able to, with minimal outreach, successfully acquire attendees to their discussion on alternative funding in the IT sector. On Monday night, Peter Rosenberg hosted his second Post-Raw Interactive Chat with guest Noelle Foley. Throughout the event, Peter and Noelle took video and text questions from fans about the 10/12 episode of WWE Monday Night Raw. In a totally unexpected moment, Noelle’s father and WWE Hall of Famer Mick Foley (better known as Mankind) popped up behind his daughter live from their living room in Long Island to answer fan questions and give his thoughts on the upcoming Hell in a Cell pay-per-view. Fans in attendance were thrilled with the surprise opportunity to interact with a certified wrestling legend. According to a recent blog post by Wainhouse Research, there are parallels between Ridley Scott's famous 1984 Apple commercial and the Shindig technology. Namely, Shindig's willingness to challenge the status quo and change the way we meet and collaborate online. Wainhouse ties Shindig's ability to adapt to consumer needs to that of Apple's. The blog post delves into how users have wrestled with tech constraints and how Shindig offers features that are not only readily available but also very needed. Shindig creates an environment where an immense amount of people can gather together online to communicate, collaborate and network. The features underscored are unique to the online video chat world, as Wainhouse highlights Shindig's unique tools to manage an event without stripping away the user's autonomy. Shindig Founder Steve Gottlieb thoughts on entrepreneurship are featured in INSIGHTS: Reflections From 101 of Yale's Most Successful Entrepreneurs. Steve's personal story 'It gives me a headache' is among one of the many stories included alongside other notables like General Assembly Founders Matthew Brimer and Jake Schwartz, The Lean Startup's Eric Ries, Rent the Runway Founder Jennifer Fleiss, Gilt Groups' Kevin Ryan, Angel investor David Rose, among many more. To learn more, click here to check out Forbes' article on the new book. On September 15, Wainhouse Research, published Connecting People Better: A New Architecture for More Natural and Productive Online Experiences. Wainhouse Research conducted a feature review of the Shindig platform, comparing and contrasting its capabilities with the other major categories of collaboration. Wainhouse Research conducted two informal “sandbox” events in June, 2015 during which they tested the Shindig platform with a number of WR clients and end user stakeholders. After the event, Wainhouse Research surveyed attendees regarding their positive and negative impressions of the experience. The result is a candid assessment of pros and cons found in the Shindig service as well as a discussion of its differentiating capabilities. Wainhouse Research is an independent analyst firm that focuses on critical issues in Unified Communications and Collaboration (UC&C) and collaborative educational technologies. The company conducts multi-client and custom research studies,consults with end users on key implementation issues, publishes white papers and market statistics, and delivers public and private seminars as well as speaker presentations at industry group meetings. Hot 97 DJ and co-host of the “Cheap Heat” podcast Peter Rosenberg hosted an interactive Q&A with fans after last night’s episode of WWE Monday Night RAW. Special guests included Rosenberg’s “Cheap Heat” co-host, David Shoemaker aka the Masked Man, as well as Stat Guy Greg. Unlike a podcast with passive listeners, fans who logged onto Shindig were given the unique opportunity to join Rosenberg onstage to discuss his predictions, thoughts and opinions on the upcoming Summerslam PPV. Rosenberg took both video and text questions from the audience for the better part of an hour before wrapping up the show at 12:15am (ET). Brandon Semenuk's one-shot, nearly four-minute slopestyle mountain bike run may go down as the longest single shot ever captured in action sports history, and has now garnered over 1.5 million views on Youtube. This uninterrupted shot was filmed by the most advanced gyro-stabilized camera system, the GSS C520, mounted to a truck on a custom road built next to a custom trail that took three weeks to build. This true cinematic achievement required perfect coordination between Semenuk, Anthill Films, and TGR with regard to athleticism, planning, timing and logistics. Injured at the time, Semenuk only hit the full line once. This Thursday, July 30th, from 3-4 PM MST, you'll get a chance to speak LIVE with Brandon Semenuk and Teton Gravity Research cinematographer & GSS operator Brian Wulf over video chat or text about how the shoot went down and just what it took to capture this mind-bending feat on film. This interactive video chat will give you the rare chance to speak with the athlete and filmmaker, one-on-one, from anywhere in the world. Shindig's Founder & CEO Steve Gottlieb presented at the monthly NY Video Meetup conference on June 25. As part of his presentation, Mr. Gottlieb and Shindig enabled a special live stream of the proceedings, complete with the ability for online users to be brought onstage to ask the speakers video chat questions before both the online and in-room audiences. Online attendees were also given the opportunity to mingle, network and socialize with fellow online attendees in private video chats before, during and after event. Other presenters at the conference included YouNow, Flipps, VHX and Eyeview. Swarthmore College's Class of 1945 hosted a 70th reunion on campus. Unfortunately, many alumni were unable to make it to Pennsylvania for the event. Shindig partnered with Margaret Bearn, reunion chair for the Class of 1945, to create an opportunity for those unable to attend to still interact with classmates via video chat. This unique hybrid event allowed for classmates on-campus and those unable to attend to to reconnect face-to-face via video chat. Many shared their favorite memories of Swarthmore. Finally, all in attendance both online and in person were treated to a live stream of Abby Hafer's (Class of 1980) informal talk on Unintelligent Design. On April 30, Actuarial Science students from Columbia School of Continuing Education tested a new Proseminar format on the Shindig platform. Thursday’s inaugural online proseminar featured Executive Vice Dean Noor Rajah giving a lecture on pensions. The students in attendance took full advantage of the ability to interact amongst each other before, during or after the lecture in private video chat. After completing his lecture, Executive Vice Dean Rajah stayed and spoke with students in the audience.